Bubs loves cake. Actually, no, that’s something of an understatement. She ADORES cake. Ask her what she wants for breakfast… cake. Lunch… cake. Dinner… cake please mummy! Needless to say she doesn’t have cake for breakfast, lunch or dinner; she hardly ever has cake at all really despite living with two prolific bakers. The weather was appalling yesterday. It chucked it down with rain for most of the day so our usual outdoor activities were off the menu and Bubs was starting to drive me a little bonkers to be honest, which is why I gave in to her request for cake. I have fond memories of baking cakes with my mum, in spite of the fact that she hated cooking and could burn salad, and I really like creating similar memories for Bubs (perhaps with a bit less swearing than mine). So we put on our aprons, pulled up a chair next to the kitchen counter for Bubs and set about making some fairy cakes. The recipe we used is based on the 4:4:4:2 method of making a victoria sponge but with a bit of baking powder to make the cakes light and fluffy. It’s an all-in-one method which is great for making with toddlers as there’s no faffing about with creaming the margarine and sugar or sifting the flour. 2 twelve hole cake tins. Pre-heat oven to 160 °C (fan). Line the holes of your cake tins with the cake cases. Put all of the ingredients into a large bowl and stir to combine before beating it like billy-o until it’s thoroughly mixed and there are no lumps. Spoon the mixture into the cake cases (I put a tablespoon and a bit in each case) and bake in the centre of the oven for 15-20 minutes. Once they’re cooled you can ice and decorate them. 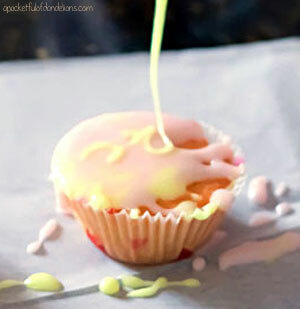 We used a simple water icing made from 6 teaspoons of icing sugar and a splash of water to mix. I also added a teeny drop of food colouring to make it more interesting. Then Bubs went to town with the decorating, we used fruit jellies and sugar butterflies but you could use sprinkles or smarties or whatever takes your fancy. 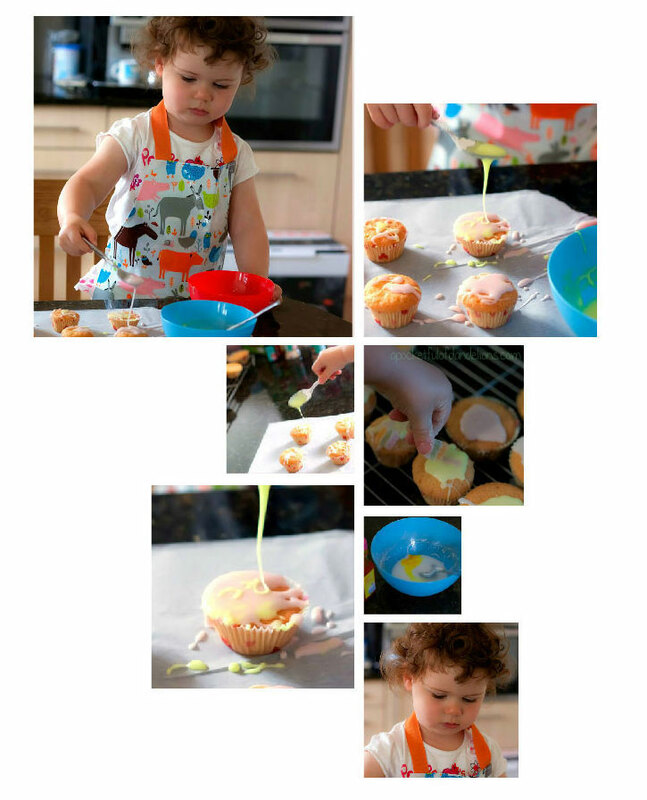 Let me know in the comments if you’d like to see more “Cake please mummy!” featured on my blog as I have loads of fun recipes that are great for getting the kids involved. What we’re reading – Don’t put your pants on your head, Fred!